The current and former Social Justice Commissioners have called for political leadership to ensure the recommendations of the Joint Select Committee on constitutional recognition are realised. 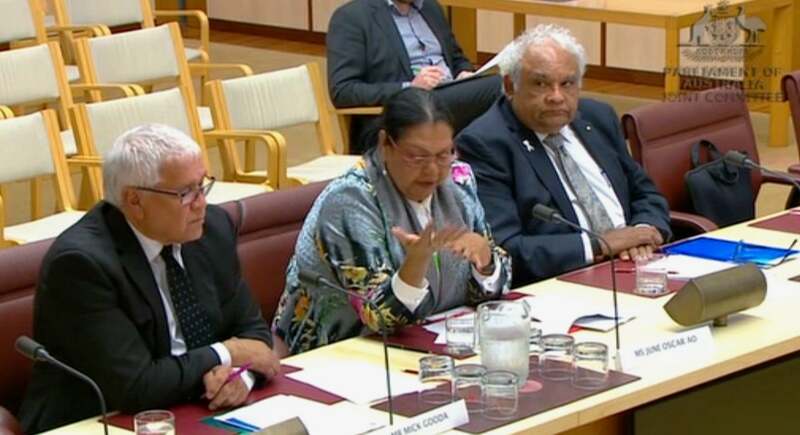 The Aboriginal and Torres Strait Islander Social Justice Commissioner June Oscar AO and former commissioners Mick Gooda, Professor Tom Calma AO, Dr William Jonas AM and Emeritus Professor Mick Dodson AM provided a submission to the Joint Select Committee, based on their 25 years of advocacy. The current and former commissioners met to discuss the Committee’s final report and its four recommendations, released on Thursday. “We welcome the fact that an Indigenous Voice to Parliament has been firmly put back on the political agenda, after being rejected by two Prime Ministers. “We support the Committee’s recommendations for an intensive country-wide Aboriginal and Torres Strait Islander-led co-design process to consider the national, regional and local elements of a Voice to Parliament. “In-line with international human rights standards, it is critical that Aboriginal and Torres Strait Islander peoples across Australia have the opportunity to discuss what these elements might look like, how they might work, and what functions they might perform. “We have consistently called for greater control over our destinies. As First Nations people, we have a right to self-determination, and to be at the decision-making table on all issues that affect us. “There can be no delay on this and we are pleased to see the Committee’s call for the co-design process to be conducted within the 46th term of parliament. “As we have stated previously, the Voice to Parliament must be constitutionally enshrined and we must do everything we can to ensure a successful referendum,” they said. The current and former commissioners said they support recommendations for truth-telling. “The history of injustice experienced by our peoples, needs to be acknowledged before we are truly reconciled. We cannot move on as a country, until we go through this process. “Like the Voice to Parliament, the truth-telling process must be co-designed with Aboriginal and Torres Strait Islander people,” they said. In their joint submission, the current and former Social Justice Commissioners called for a Truth and Reconciliation Royal Commission. “We believe this could provide the substantial authority needed for this necessary process to take place. We should look at the experiences in other countries with similar histories to our own, for example, the Truth and Reconciliation Commissions in South Africa and Canada, and the Waitangi Tribunal in New Zealand. “We also support the recommendation for a National Resting Place for Aboriginal and Torres Strait Islander remains in Canberra. And we agree this must also be a place of truth-telling, of healing and commemoration, again co-designed with our people,” they said. On the issue of racially discriminatory clauses in our Constitution, the current and former Commissioners said they were pleased to see the Committee has suggested that the race power be reconsidered after the process of co-design, as part of a package of reforms. “Australia’s reputation as a country that respects the rule of law and human rights is diminished by the continuation of racially discriminatory provisions in our founding document,” they said. The current and former Commissioners said it’s critical the Committee’s report and its recommendations are acted upon. “It is well and truly time our governments are held to account in realising our rights and respond to us by using this report and this new set of recommendations, so we have a way forward to be reconciled and be recognised. “We can no longer wait. The time to act is now,” they said.